Lumbarda village on the Croatian island of Korcula is an unspoilt sun soaked paradise and the perfect holiday destination for all ages. Whether it’s a family holiday, a couple’s or friends' getaway, a romantic retreat, or an active sporty adventure, this idyllic location has it all. Lumbarda Resort Apartments is the premier holiday destination on the island, sitting right on the edge of the Adriatic Sea where the crystal clear water and the unspoilt landscape is just breathtaking. Each newly renovated apartment can accommodate four people or more with all modern conveniences such as TV, WiFi, and air conditioning, and has an outside terrace and seating area with spectacular sea views. This clean and safe family friendly resort has an on-site swimming pool, restaurant, and English speaking staff. Overlooking sandy beaches and a marina, there are many options for sunbathing and swimming on the doorstep. Equally, activities such as windsurfing, paddle boarding, jet skiing, canoeing, or sailing are just steps away. To discover the unspoilt beauty of the island you can stroll or cycle through the many vineyards, olive groves, and pine forests which reveal magical coves and hidden beaches where you can swim in the turquoise waters of the sea. There are many wineries that are happy for you to visit for tastings or to buy the best local wines. Bicycles, scooters, and beach buggies are available to rent, and the medieval walled town of Korcula is just 10 minutes away. There are plenty of restaurants and bars where you can enjoy the very best of cuisine and wines, especially the renowned GRK wine which is unique to the island, while sitting at the water’s edge watching the sun go down. The options for day trips are endless, and include the nearby islands, such as Mljet, or visits to Dubrovnik, Split, Medjugorje, and even Mostar. The holiday season runs from May to October and Croatia is well served by many budget airlines flying directly to Dubrovnik and Split. 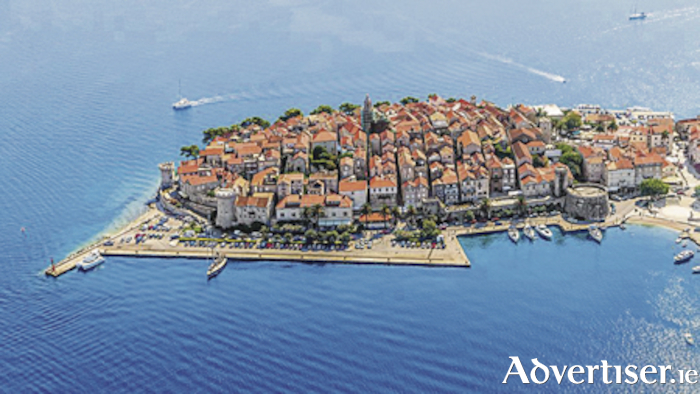 Transfers are easily arranged at low cost from the airport directly to Korcula island if you choose not to rent a car. For more information see www.lumbardaresorts.com or visit the Lumbarda Resorts stand at the Holiday World Show in the RDS in Dublin from January 26 to 28. Fancy a new approach to cruising for 21-45 year olds, well then look no further..River Cruising has just got a make over.